Boberdoo is an application service tool for the lead generation industry. 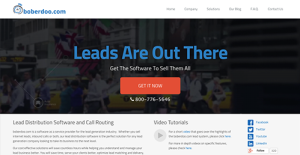 Whether your company sells Internet leads, inbound calls or even both, this lead distribution software is an ideal solution for any lead generation business that is looking to take its operations to the next level. Its cost effective features will save businesses countless hours while helping them understand and manage their lead business better. Companies will save time, serve their clients better, boost lead matching and delivery, and improve the overall image of their lead company by using this lead distribution software. Clients can completely automate the regular tasks of lead management, accounting, lead distribution, billing and reporting with this tool. With boberdoo.com, you can track and segment your incoming leads coming from different sources and route them to clients based on special business rules. The boberdoo.com system manages inbound call routing for clients that sell phone calls. Many of its clients advertise their contact numbers online and on TV, radio, print, which are then routed through boberdoo.com according to the custom business rules they establish. The tool has the flexibility and reliability to meet your technical leads, from pinging in various formats to hash distribution directives. Over the past 15 years, it has continually provided the resources needed to grow your company’s lead business. The system enables you to automate distribution, lead management, billing, accounting, and reporting with its built-in capacity to handle inbound/outbound phone routing, traditional web leads, and ping post. It is considered among the most sophisticated lead distribution software solutions in the market. The tool is a complete backend program that tracks, segments, and as well as distributes leads in any vertical, real-time. The boberdoo system is a complete backend solution that tracks, segments and distributes leads in any vertical in real-time. Since 2001, the software has been helping lead companies increase their efficiency and consolidate all back-office needs onto one platform. Route and bill for domestic and international calls with the same logic as web leads. Ideal for raw calls, live transfers and click2call campaigns. Boberdoo also comes standard with an advanced ping post solution. Features include advanced pricing scenarios, shared legs with partner hashes and dynamic profit margin calculations. Form builder, host-and-post, web and phone campaigns with four payout types and customizable affiliate logins in one system. Easily bill for each lead with a number of options including prepay, automated invoices and auto re-billing. The system also has multiple reporting options, notification and additional tools. What Problems Will Boberdoo Solve? Some companies still sell all their leads on a one-off basis, usually managed on a series of spreadsheets. The boberdoo system gives these companies a complete, automated, real-time solution for selling leads in any vertical. The vendor also encounters many companies that have either built their own lead distribution system or are using another solution that can only handle low volumes of leads or pings. Companies that build a proprietary system almost always run into the situation where they are paying more to customize and update their system than if they were using boberdoo. Other companies that use alternative ping post technology tend to run into issues if they exceed a certain volume of pings. boberdoo processes over 8 million pings per day and the vendor says it has never experienced issues with volume. Because very few solutions integrate both web leads and calls in one platform, many companies balance all of their lead traffic between multiple platforms. boberdoo incorporates both web leads and calls into one platform, allowing one-stop usage, billing and reporting. Organizations have unique wants and requirements and no software solution can be ideal in such a scenario. It is futile to try to find a perfect out-of-the-box software app that meets all your business needs. The smart thing to do would be to customize the solution for your specific requirements, employee skill levels, finances, and other aspects. For these reasons, do not hurry and pay for well-publicized trendy solutions. Though these may be widely used, they may not be the best fit for your unique requirements. Do your groundwork, check out each short-listed platform in detail, read a few Boberdoo reviews, contact the seller for explanations, and finally choose the app that offers what you need. How Much Does Boberdoo Cost? Contact the vendor for details regarding their enterprise pricing plans and other product information. We realize that when you make a decision to buy Lead Management Software it’s important not only to see how experts evaluate it in their reviews, but also to find out if the real people and companies that buy it are actually satisfied with the product. That’s why we’ve created our behavior-based Customer Satisfaction Algorithm™ that gathers customer reviews, comments and Boberdoo reviews across a wide range of social media sites. The data is then presented in an easy to digest form showing how many people had positive and negative experience with Boberdoo. With that information at hand you should be equipped to make an informed buying decision that you won’t regret. What are Boberdoo pricing details? What integrations are available for Boberdoo? The tool can build custom integrations to any CRM or Lead Management System. If you need more information about Boberdoo or you simply have a question let us know what you need and we’ll forward your request directly to the vendor.